The Use Case is a means to understand how a technology, innovation is applied in real life and what kind of advantages this could bring to end-users and stakeholders. TAPPS project has two Use Cases: Automotive and Healthcare. On one side, TAPPS is applied on an electrical motorbike (Energica); on the other, on a smart trolley for preparation and administration of therapy in the hospital (San Raffaele Hospital – FCSR). 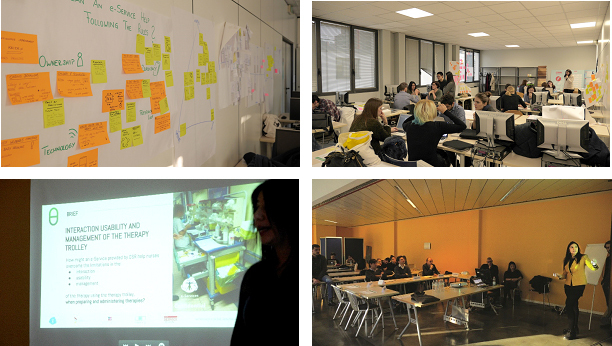 In this post, we would like to share the experience of the workshop we organized for the Healthcare Use Case, that took place in Milan in the San Raffaele Hospital structure (third party of TAPPS project) from the 3rd to 10th of February 2016. The output we asked the students was four high-level concepts each concerning one of the four macro-areas of problem: 1) misleading communication and misunderstanding between hospital staff; 2) interaction, usability and management of the therapy trolley; 3) misalignment between nurse activities and standard rules of the Hospital 4) distractions the nurses are forced to face during therapy sessions. 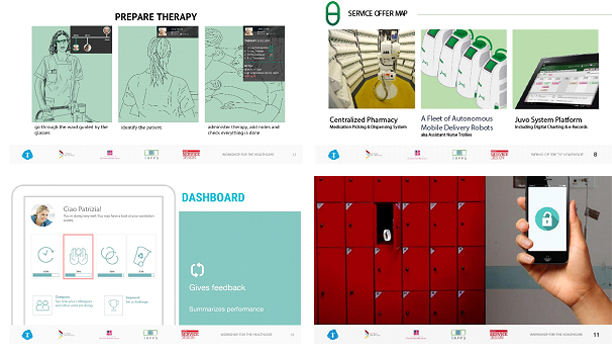 The aim was to receive as many “fresh” ideas as possible in terms of potential functions, applications of/in the smart trolley as an open CPS. We gave as input material our desk and field research reports, such as state of the art, interviews and direct observations, and exploited some typical design thinking tools for the generation of ideas: brainstorming, clustering, mapping, and so on. The students also had the chance to visit four San Raffaele Hospital departments and see the medical context themselves. The phases of the Workshop consisted in: 1) IMMERSION to the context; 2) GENERATION OF IDEAS divided into DIVERGENCE (many different ideas) and CONVERGENCE (cluster/selection of a few best ideas); 3) CRAFTING of the concept and 4) SHINING through a presentation to Hospital representatives. The results of students’ work were four different developments and improvements to the actual therapy trolley. For the staff communication problem, smart glasses were exploited to facilitate nurse-nurse and nurse-doctor real-time communication; for the enhancement of trolley-nurse interaction, the smart trolley was seen as part of a complex system that included clinical wards, pharmacy and all medical stakeholders to reduce the medication errors through automatized components that help nurses’ tasks. For the alignment of nurses’ activities with Hospital procedures, a smart tracking bracelet was seen as a solution to raise awareness to nurses of their own activities by keeping track and giving real-time alerts; this device would transmit data to the smart trolley dashboard, where each nurse would see her activities regarding specific aspects. For the distraction problem, the concept consisted of a smart cabinet to put away the nurses’ phone and a system to indicate the next available nurse “to be disturbed”. The workshop was an enriching, huge experience to involve people external to TAPPS project from different fields of interest into creating high-level concepts on how open CPSs could be implemented in the form of services to be used at end-users’ advantage. The Workshop for the Healthcare was organised by our partners FCSR in Milan with the participation of different experts from the Hospital: Health Department (Hygiene & Sanitation and Quality & Accreditation), Nursing services, Scientific Research Department. 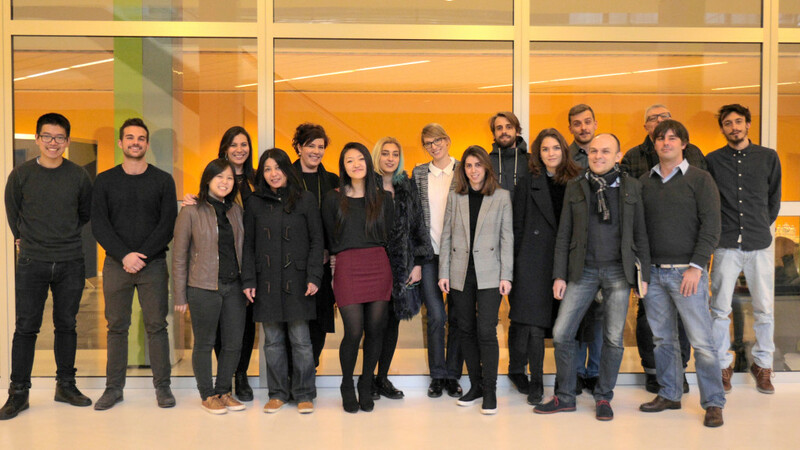 Thanks again to the teachers and students from Master in Service Design of Politecnico di Milano for such a big interest in our project and for their effort!